Soil potassium deficiency, plant potassium deficiency. Suitable for application through irrigation: drip, sprinkler or pivot. Low Salt Index – suitable for foliar or soil use. Plants generally use as much Potassium as they do Nitrogen. Even in soils with sufficient “available” potassium, plants can experience a shortage late season as the Potassium in the immediate vicinity of the root hairs is used up. Applied Potassium in the root zone is often useful late season, esp in multiple fruiting crops (cotton, cucurbits, tomatoes, etc.). 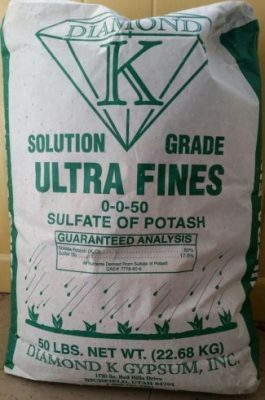 Reasonably priced and easily fertigated DK Potassium Sulfate can be a good choice in that situation.